HBO is at the forefront of the "peak TV" revolution. From The Sopranos and The Wire to Game of Thrones and Westworld, the US premium cable network has produced high-quality content for two decades. On Sunday, it is breaking new ground with its first non-English series, My Brilliant Friend, an Italian-language adaptation of a wildly popular series of novels by Elena Ferrante. 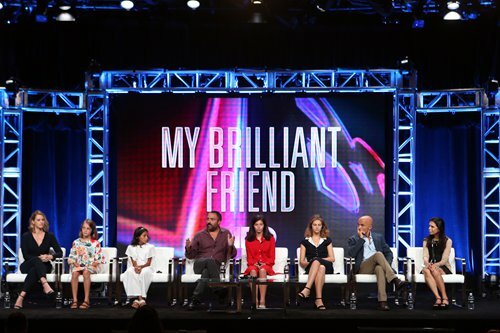 The much-anticipated premiere is evidence of the globalization of television in the internet era, with audiences no longer primarily concentrated in the US. Fans of the books - Ferrante is a pseudonym and the true identity of the author is unknown - are champing at the bit to see the series. More than 10 million readers have fallen in love with the novels - the tale of a life-long friendship between Elena and Lila, who first meet in Naples in the 1950s - since the first one was published in 2011. Even in the US, where books translated into English barely represent 1 percent of the market, the four Neapolitan Novels have been big business, with 2.6 million copies sold, according to publishing house Europa Editions. "There, in that moment I understood why HBO is HBO." Such attention to detail and authenticity is relatively new in the US. In 2009, Quentin Tarantino tiptoed in that direction with World War II romp Inglourious Basterds, which was filmed in part in German and French. Then came The Americans (2013-18), the award-winning FX series about Russian spies living in the US during the Cold War, which featured long sequences in Russian. And as the world's television consumers turn more and more to streaming platforms to find new shows, they are more open to subtitled programing. Danish political drama Borgen is one striking example of cross-border success. Netflix's Narcos - which was filmed in Spanish and English, and debuted in 2015 - "opened the door for the others, by showing that authenticity was vital to the success of a series," explains Lorenzo Mieli, executive producer of My Brilliant Friend. Francesco Piccolo - who co-wrote the screenplay with Costanzo, Ferrante and Laura Paolucci - said the author made suggestions throughout the process, and gradually became more at ease. Filmed in an industrial wasteland in the Naples area, the series brings to life the neighborhood that is stifling them, with only a courtyard on which to play and school as the only escape. "We don't see people running around all over the place - instead we are focused on the complexity of the female characters' point of view," he explained.